Our Copper reflective window film, also known as Mirror Film is by far the most effective window film when it comes to excess sunlight and glare. Purlfrost's reflective film can be applied to most glass surfaces and the effects will be immediate. The film comes in three grades and can be purchased by the metre, but for ease of installation, we would recommend the "Cut to size" option. Available by the metre or cut to size. Keep your home, office or conservatory cooler. 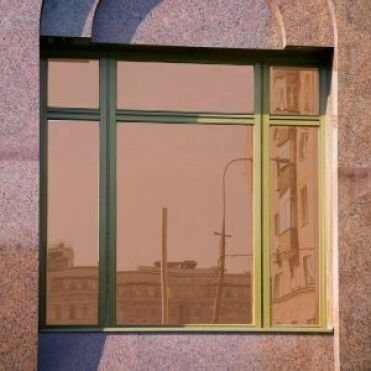 Purlfrost’s copper reflective window film, also known as Mirror Film, is the perfect option for excess sunlight and glare. Our reflective film gives instant results and can be applied to most glass surfaces. With three grades to choose from, our copper reflective film can be purchased by the metre, but we would recommend our "Cut to size" option that helps with installation. With a sleek appearance and hugely effective heat and glare reduction capabilities, copper reflective film has long been the preferred solar control option for commercial buildings. Many working on computers close to windows can be affected by excessive amounts of light and glare that can often cause headaches and a loss of productivity. This is why copper reflective film can be a useful tool for companies beyond their aesthetic reduction of light in the workplace. How does reflective film works? As probably expected by its name, excess sunlight is reflected away from the window. This type of film also stops 99% of UV light from entering. This can be especially useful for any painted objects within your office or home that can become faded over time. Our reflective films come with a 10 year warranty, but they will last much longer. How is reflective window film manufactured? How is reflective window film applied? The film is a self adhesive material that is applied with a soapy water solution and a squeegee that ensures that there are no bubbles in the film. Mirror film is just another name for reflective window film. This is because of copper reflective film’s added benefit of providing privacy from outside during daytime hours, something especially useful for offices or rooms on lower levels in residential areas. The level of privacy that this film does, however, vary. The darker the film, the more reflective it is – so if you would be purchasing reflective film primarily for this reason, opting for our darkest copper film would be best. It is also worth noting that reflective film does require light for it to be in effect, so it will only offer privacy during daytime hours. If you are planning to install this film on a double glazed unit, make sure the glass is toughened. If it is, it will have a kite mark in one of the corners of the pane. If you apply this film on glass that is not toughened, the glass could crack due to poor build quality especially on older units. Please use a MEDIUM grade copper reflective film as an alternative to the dark. Can I remove the reflective film at a later stage? Absolutely. You will need a spray bottle, some soapy water, and as wide a glass scraper as you can get. Click here to view our range of window film installation and removal tools. How do I clean reflective film? Just clean with soapy water and a squeegee, that's all. Using anything abrasive when cleaning will eventually damage the film. Wait for 4 weeks after installation before you clean the film.